A richness of voice; a depth of emotion; wisdom beyond her years; with brand new record Listen To Formation, Look For the Signs, Nadia Reid has claimed her place as one of New Zealand's most evocative and profound young songwriters. Her debut album Listen To Formation, Look For The Signs follows her 2011 EP Letters I Wrote and Never Sent. Nadia recorded her debut EP with Ben Edwards, owner of Lyttelton Records and producer for Aldous Harding and Marlon Williams. The experience proved fruitful and both were eager to work with each other again. After some successful crowd-funding to help pay for the recording, they both entered Edward's Sitting Room recording studios. What unfolded was not a huge shift in production values or stylistic changes from the EP. Reid well and truly remains true to her acoustic folk roots, but stretches the songs out with her band around her. On Listen To Formation, Look For the Signs, bassist Richie Pickard, guitarist Sam Taylor and percussionist Joe McCallum give Reid room to push new boundaries. 'Reaching Through' pays some homage to the Mary Chain with its cranked up guitars, and 'Holy Loud' also keeps the album electrified. Nadia still knows how to slow thing down and break your heart! Lead single 'Call The Days' is harrowing with its haunting cello and delicate (yet determined) guitar. Other tracks like 'Runway' and 'Some Are Lucky' will immediately bring to mind familiar touchstones like Jolie Holland and newer voices like Agnes Obel. 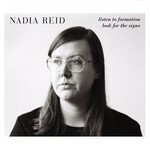 An album with the range and breadth of Listen to Formation, Look For The Signs will surely bring more eager fans into the Nadia Reid fold.